Welcome to the Crazy Crafters' Blog Hop with our Special Guest stamper, Billie Moan - we are thrilled to have Billie join us this month and so excited to CASE (Copy And Selectively Edit) any project that has been created by her. I've been following Billie's work for quite some time now and she never disappoints. Her blog is always well-written and informative and I love her B-isms! I love so much of her work that it was incredibly difficult to narrow down what to CASE. After much deliberation, I chose this card because it uses masking techniques that I've always loved. 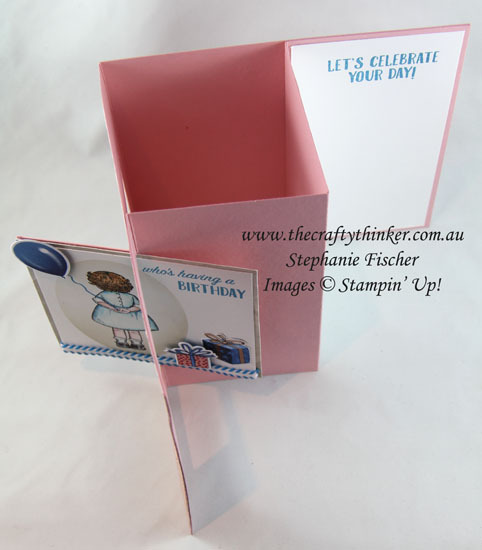 This is a Lever Card - a fold that I love because it's not too difficult to make but looks quite impressive! I used some products from our current catalogue and some that will be available when the new Annual Catalogue launches on 1st June - a bit of a teaser! 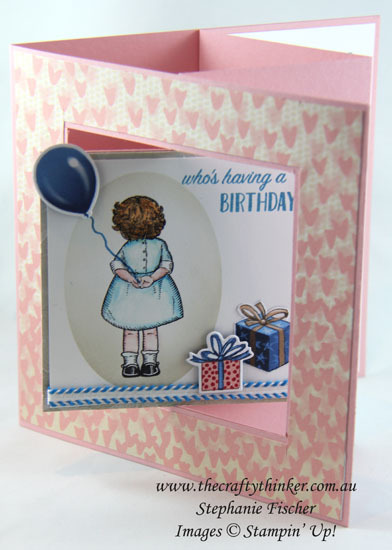 The gorgeous little girl is from the Birthday Delivery stamp set. 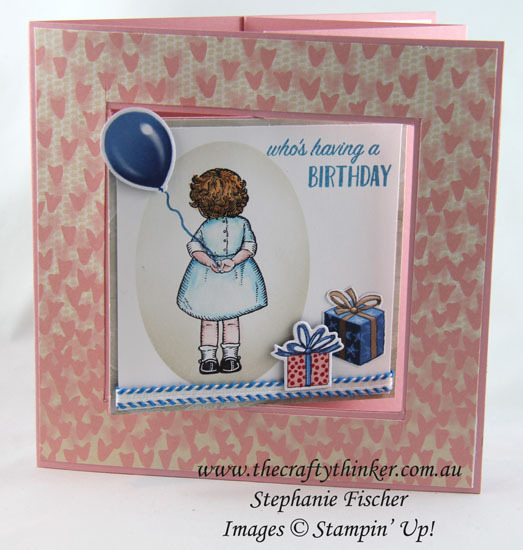 This Birthday Delivery product suite is very nostalgic in its imagery and is just gorgeous! It's also very clever. The exquisite Birthday Memories Designer Series Paper contains beautiful images that, in addition to the stamped images, can be cut out with the matching Birthday Friends framelits! I made the lever card with Blushing Bride cardstock and decorated it with paper from the Falling In Love Designer Series Paper. I then used Sahara Sand ink and a sponge to lightly sponge colour into the oval. I applied more ink at the bottom of the oval to balance it. I removed both masks and watercoloured the girl using Soft Sky, Pacific Point, Peekaboo Peach, Soft Suede and the new Powder Pink inks. I stamped the greeting with Pacific Point ink, added the presents and ribbon and drew in the string to the ribbon with a Pacific Point Stampin' Write Marker. Note: I use the acetate that forms part of the packaging for photopolymer stamp sets to make my masks. I keep the mask for future use - positive and negative spaces ie the oval shape as well as the rectangle with the oval cut from it. I only adhered half of the decorated panel so that the decorative piece swings a bit free from the card, providing a softer angle when the card is open. 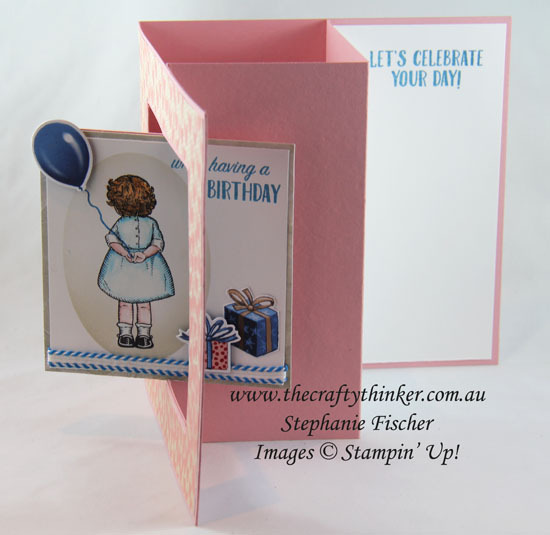 The Birthday Delivery Bundle (10% saving) will include the stamp set, framelits and Designer Series Paper. If you you'd like the opportunity to order the new products a month early - check out the Join My Team page of my site!